A good make up brush is almost as important as the cream or powder you're applying; especially if you're concerned with having an authentically natural beauty regime. Here are a few tips on what to look for when searching for the green brushes to match your organic make up and how you should take care of them. Choose a brush that is made from sustainable materials rather than plastic. Bamboo or aluminium handles are good. Bristles. This depends on where your loyalty lies. Synthetic bristles, like those used for Inika Cosmetics brushes are Vegan because they contain no animal hair. Often made from Taklon or nylon these brushes are best used from cream-based concealer, foundation and lipstick. Natural fibre bristles can be made from the hair of squirrels, goats, horses, minks, sables, badgers, mongooses or a combination of a few. This doesn't mean the animals were treated badly to get their hair. Horsehair that is groomed and cut regularly may be a better option than stripping a squirrel of its coat for example. Natural brushes are best for applying powder foundations, powder blush or powder eye shadows. 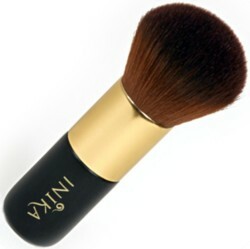 One exception is the vegan kabuki brush by Inika which is absolutely THE best mineral powder foundation brush we've found. For men our hand made shaving brush has a sustainable maple base and unbleached natural bristles is a good traditional natural grooming brush. To keep your brushes in good condition try to wash them at least once a week to avoid pimple outbreaks and lessen the risk of bacteria causing infections on the face (especially near the eyes). Using a mild natural soap or shampoo rinse brushes overnight in warm water. Dry gently using a clean towel and lay them flat to air dry.